Some 20 years ago, the United Nations decided to build Conflux City on an artificial island in the middle of the Atlantic. The idea was to build it away from any other country, outside the jurisdiction of any super hero team, and at the same time free of crime and corruption. This self sufficient city would represent all the cultures of the Earth under the same sky, and would serve as a global capital for the world. The construction of the city finished 5 years ago, and its inhabitants count has been rising ever since. The city is now governed by the Council, a group of 9 individuals elected by the citizens, some of them the mostr brilliant minds of the time. The JLA tried to convince the UN to let them protect the city, however, the council had other plans, and instead restricted their access to Conflux city. Only under global threat level events would the league be allowed in Conlufx soil. The same was true of any other enhanced individual organizations. Conflux city had a law enforcement corp equipped with advanced tech, but they were no fools as to think that no enhanced criminal would dare to try and take this city for themselves. And they were certain their police force would be helpless against them. That is why before the construction of the city was finished, the UN started a long process of recruiting and training a team of enhanced people from all around the world. Only 5 of them were selected to be the Guardians of Conflux City! This game will take place in a DC setting, although most of the action will take place away from the iconic places and the DC character cameos will not be abundant. Characters can be from any part of the world, humans preferably. They can be established DC superheroes, however they can not belong to hero teams. You can also make original characters. Whatever suits your fancy. Keep in mind this is a mature game, were death violence and other things alike are bound to happen, however, not in a gruesome way. Think Batman vs Superman. No specific houserules, but try to keep your hands off Variable, regeneration and minions. They give me headaches. So, I'm taking two more players to fill in for people who vanished, Jemal and Meta Shaman. There is the character Grit, who if someone wants to take him is yours for the taking, plus getting extra consideration since I like the character. You are also welcome to create your own PC, taking in the guidelines exposed above. Consider the type of characters who made it in in the first place as guidelines for backgrounds and character types. Last edited by Camus on Thu Mar 16, 2017 1:04 am, edited 8 times in total. Could be interesting. Let me give this some thought. Paul Stubbs was one of the saddest things in the world, a failed clown. He went to school for accounting, and made decent money for several years at an office firm, but his heart was always in entertaining people. On his weekends, he studied magic tricks and gags and learned to make balloon animals. He checked out books on how to build your own clown costume. He designed his own face paint and submitted it to Clowns International to be put on an egg in their registry. He started a side business, appearing for children's parties and bar mitzvahs. There was just one problem... his act stank. He had the passion. He had the technical skills. What he lacked was some je ne sais quoi quality that would let him connect with audiences. And so, one day, shuffling home from another gig where he'd been ushered out halfway through with nothing more than cab fare, his oversized shoes squeaking in the much, he decided that it was the last straw, that he would have to give up the dream. And that's when Dionysus visited him. He believed that the world was too serious, and that someone needed to spread joy among the world, a little bit of unpredictability. He requested that Paul be his vessel, and said that he would request nothing more of him than to spread joy, and he accepted. In retrospect, he didn't entirely realize what he was getting into. Paul's costume is now a part of him. The facepaint doesn't wash out. The fabric is his skin. And you know what? He couldn't be happier. Not only is he now able to pursue his dream, but his powers also allow him to combat injustices in grand style as Pratfall, going toe-to-toe with criminals and foiling their schemes, making them look ridiculous in the process. Just to add a cherry on top of the sundae of his life, some of the officials in charge of determining candidates for the Conflux team were present at a charity banquet where he was performing, and where he took out a group of attempted hostage takers. The things, and the audience, thought it was just all part of the show, breakaway chairs and squeaky hammers, but the end result was a half dozen unconscious thugs and a highly entertained audience. 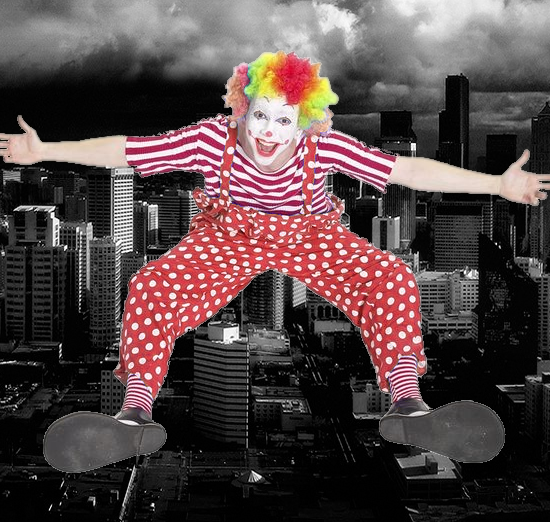 They're a little leery of the clown theme, parallels to Gotham, but they also figure he'll go over well with the kids. Power Loss — Paul's powers sometimes desert him, particularly when he performs actions without a punchline. Maybe it's psychological, but he has a hard time using his powers when it isn't funny to do so. Power Source — Paul has been mystically invited and charged by the Greek god, Dionysus. At times, the power of the gods has waned and their envoys have similarly lost their powers. Responsibility (Spreading Joy) — Paul feels obliged to contain the mission he was empowered for, and just doesn't feel complete in a day where he hasn't made the world a happier place for at least one person. Obsession (Clowning) — Whether it's the some aspect of the mystic empowerment, a method of coping, or simply hidden depths, Paul is constantly cracking jokes and attempting gags. It can really wear on a person around him. Prejudice (Clown) — Some people just really don't like clowns, and few people take them seriously. Last edited by FuzzyBoots on Thu Dec 01, 2016 10:50 pm, edited 4 times in total. Interest is piqued. May make something for this campaign. They'll be a PL10 pure strength powerhouse when I get around to making them. A solid build and an interesting character, but perhaps too dark, unstable and demonic to be selected by an organization like the UN to keep peace and order. Think less Gotham perhaps? MetaShaman wrote: Interest is piqued. May make something for this campaign. Would canon alins be allowed? I was thinking of a hero who's primarily a telepath, yet has all the abilities common of Martians. Because, well, he is one. A white martian specifically, who's become completely unaware of his origin or original purpose. Instead, he considers himself to be a gifted metahuman. And if I changed the background so that he's simply mystically empowered with more benign motives to entertain? That would work I think. Keep in mind these are people that are selected to act as protectors of a city, and I wouldn't think of any reason why would anyone want to hire a psychopath bloodlust clown with self control issues. Doctor Malsyn wrote: Would canon alins be allowed? I was thinking of a hero who's primarily a telepath, yet has all the abilities common of Martians. Because, well, he is one. A white martian specifically, who's become completely unaware of his origin or original purpose. Instead, he considers himself to be a gifted metahuman. Aliens are Ok. Isn't that kinda like Miss Martian? So these people have been in training for 20 years to be this island's super team? Or 5? Or somewhere in between? Camus wrote: That would work I think. Keep in mind these are people that are selected to act as protectors of a city, and I wouldn't think of any reason why would anyone want to hire a psychopath bloodlust clown with self control issues. ^_^ You are right. I transplanted him from a darker setting. I've changed him to be much more benign. Is it? I've never watched young justice, thought she was a green martian like MM. She uses Martian shapeshifting to hide being a White Martian, and disguises herself as Green. I believe it actually comes out to PL 10 120 PP in this case, no? I ask because 10 PP matters a lot when building a powerhouse.